Michele is chugging along on her Saturn Sweater. Michele is into crocheted pouches. She likes the Honeybee Waffle Clutch by S. Maugard and also the Handy Cotton Pouch by Melissa Hills from kpixie/ Midnight Knitter. Jill is loving shawls by Kristina Vilamaite shawls including Seeds to Flowers shawl and Aglow. She also loves the Summer Mosaic Afghan by Julie Yeager. It was a mystery afghan project, but is now for sale all together. Sophie's Universe - Genevareclaimed's Micro Sofie. Favorite patterns for Wolle's Color Changing Cotton: Holden shawlette and patterns by Mindy Ross, including Dangling Conversation. 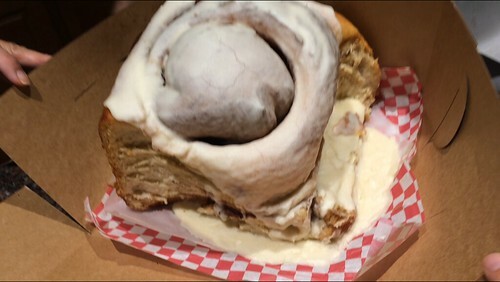 Stuffy's II and the giant cinnamon rolls! There are still almost two weeks left in our Craft-a-long! Get your projects posted in our group thread before we lock the thread on Nov 1! 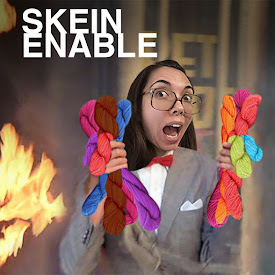 We are giving away a skein of Unwind Yarn Company yarn and a pattern to a participant in our group to celebrate surpassing 1000 members in our Ravelry group! The winner was chosen at random from our participants, and it was RosehipChick who is Hanna from Tasmania!